Can I get a testimony? Does God really still deliver people? I mean I remember Noah and Abraham, and even Daniel and those lions. But does He really still do that kind of thing? My testimony is yes and amen! So, how did I get here you ask? I have lived in abuse, years upon years, relationship upon relationship. I have been married – (more than once), and I have been divorced – (more than once) to abusive men. I have been to the shelters, time and again. I have had restraining orders, had them broken, and called the police again. I have been to court more times that I can count. I have fought for my children and their rights for child support. I have had suicide attempts and thank you Lord, I did not succeed. I have been to the Mental Health Ward – more than once. I have gone to the counselors, taken the “happy pills” and lived in ‘la-la land” for months at a time. I have been treated for depression and at one time in my life , I did not get out of bed for 6 months. I have lived through 10 years of “meetings” and I’m still here! I didn’t grow up in church. I knew there was a God, but I really didn’t think he wanted anything to do with me – not after what I had done. I viewed God like any other man I had met – a control freak who was out to hurt me. Until that last time at the shelter. My kids had drawn some pictures with the children’s counselor that rocked my world. They made me cry, and finally see the truth of abuse that we had been living in. It was there in the Domestic Violence shelter that I said, “OK maybe I don’t know you God – can you just show me who you really are?” And things started changing. Our 30 day stay at the YWCA was lengthened to 40 days. And I was accepted to a new program at our local Salvation Army called Project Breakthru. It was a year and a half program and if I completed the classes they would help me with rent. I only paid 30% of my income. At the time I was waitressing – part time. I was afraid I wouldn’t make it. But God made a way – we had our own 3 bedroom apartment within a week. Over the course of the next 18 months I had taken classes on budgeting, nutrition, Life Changing Courses, and more. Also went through another divorce another restraining order, and umpteen times to court to fight for child support. It wasn’t easy, but it was worth it. I have laughed, I have cried, I have believed, and I have doubted. But through it all, God has been faithful. He has made a way for me and my children where there was no way. He has protected me and my children supernaturally, more than once. He has provided for us faithfully – oh the stories I could tell. He has restored my peace of mind. I am no longer taking any ‘happy pills’. I do not hear “the voices” in my head that used to scream things at me, or whisper and laugh at me. I do not live in the land of shame and guilt anymore. And most importantly, my children and I are safe. No more fear, no more hurt, no more abuse. We have changed addresses! I am not that same person I used to be. But I had to learn what healthy relationships were. And I had to learn to establish boundaries in my life. Today, I do not live in fear. Today I am not a victim of abuse, I am a beloved daughter of the King. I am life that God has touched, rescued, and changed. I know that God exists, He saved my soul from the pit. He protected me and my children, He rescued and delivered us, and I know He will do it for you too! Here is my new Gravatar, just so you know it’s me. It’s from Genesis. Remember when Noah sent the dove and it brought back an olive branch? Proof that the new land was ready for habitation and that the flood was over! 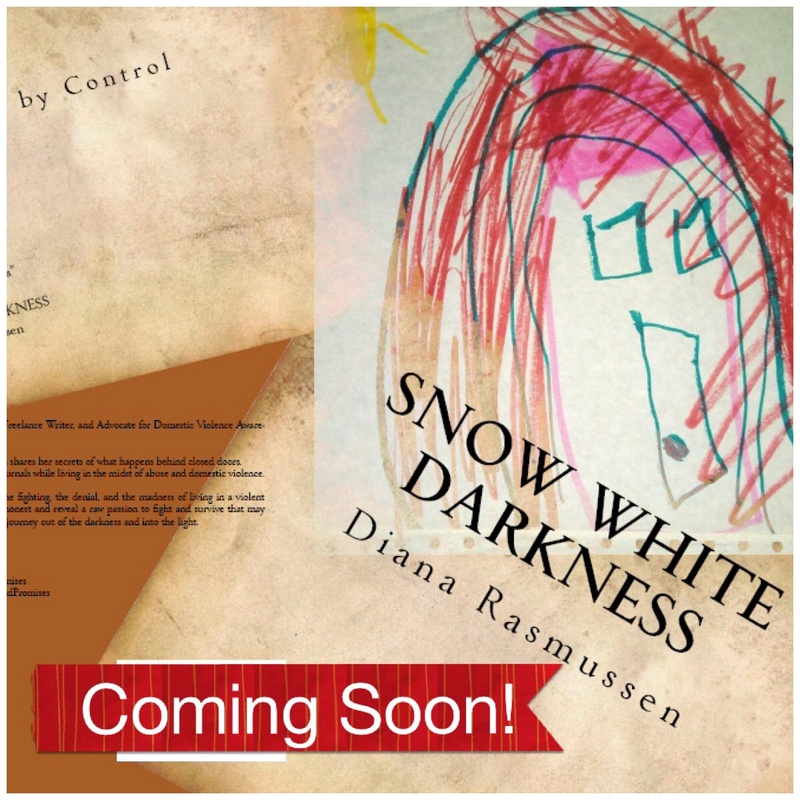 NEW BOOK “Snow White Darkness” COMING SOON! Posted in 12 steps, Depression, Domestic Violence and Abuse, Healing, Spirituality, Uncategorized and tagged Abuse, Deliverance, Domestic Violence, God, healing, Hope, Inspiration, protection, Recovery, Religion and Spirituality, Spirituality, Testimony, violence. Bookmark the permalink. Bless you, Diana. And, yes, He still delivers people. How else would I have become saved at 55 years of age? Yes, ma’am, He delivers, and His patience is endless, waiting for some of us to just say, “Yes,” to just drop to our knees and surrender. He holds out His hand in gentle invitation, and there is incredible peace that awaits those who place their hand in his. Amen Susan, amen. I am so grateful for his gentleness! I love this testimony! God bless you Diana! Stay strong in the Lord; you are indeed His daughter – and a princess of the Kingdom of God! God loves you so much! Blessings to you and your family – may He grant you great favor in everything you set your hand to – in the matchless name of Jesus!